AP ELECTIONS – General Elections to the House of People and Andhra Pradesh Legislature Assembly - Sanction of Special Casual Leave to the Presiding Officers and Assistant Presiding Officers on the next day of poll – Orders - Issued. AP GENERAL ADMINISTRATION (ELECTIONS.A) DEPARTMENT. AP G.O.Rt.No. Dated:10-04-2019. 12th April Sp. Casual Leave Sanction for PO/ APO | Duty Certificate After Polling Day. 1. G.O.Ms.No.119, General Administration(Election-B) Department, dated:25.4.2014. In the reference 2nd read above, it has been represented that the Presiding Officers and Assistant Presiding Officers of a polling booth have to hand over the Polled Ballot Boxes/EVMs & all other material at appropriate reception centers in the mid night of the poll day and they are not able to reach their home upto 1.00 am or 2.00 am and it has been requested to treat 12.04.2019 as Journey Day and to arrange to issue necessary orders in the matter. 2. Government, after careful examination of the matter, have decided to accept the said request. 3. Accordingly, all the leave sanctioning authorities of the personnel, who have been drafted as Presiding Officers and Assistant Presiding Officers are, hereby directed to grant Special Casual Leave on the next day of poll to their staff members, whose services have been utilized as Presiding Officers and Assistant Presiding Officers during the General Elections to the House of People and Andhra Pradesh Legislature Assembly on production of a leave letter together with the Election duty Certificate issued by the concerned Returning Officer at reception centre for the said purpose. 4. All the District Election Officers are requested to direct all the Returning Officers to issue an “Election Duty Certificate” in the format appended to this order, to all the Presiding Officers and Assistant Presiding Officers, who have actually attended the duty in Polling Station, at the reception centre after handing over all the relevant election material so as to enable them to avail the said Special Casual Leave. The reserve Presiding Officers and Assistant Presiding Officers are not entitled for this facility. 5. All the Departments of Secretariat / Heads of Departments / District Election Officers are requested to communicate these instructions to all concerned, particularly, the leave sanctioning authorities of the Presiding Officers and Assistant Presiding Officers from which Department/ Office they have been drafted for the election duty, for taking further action. 12th April Sp. 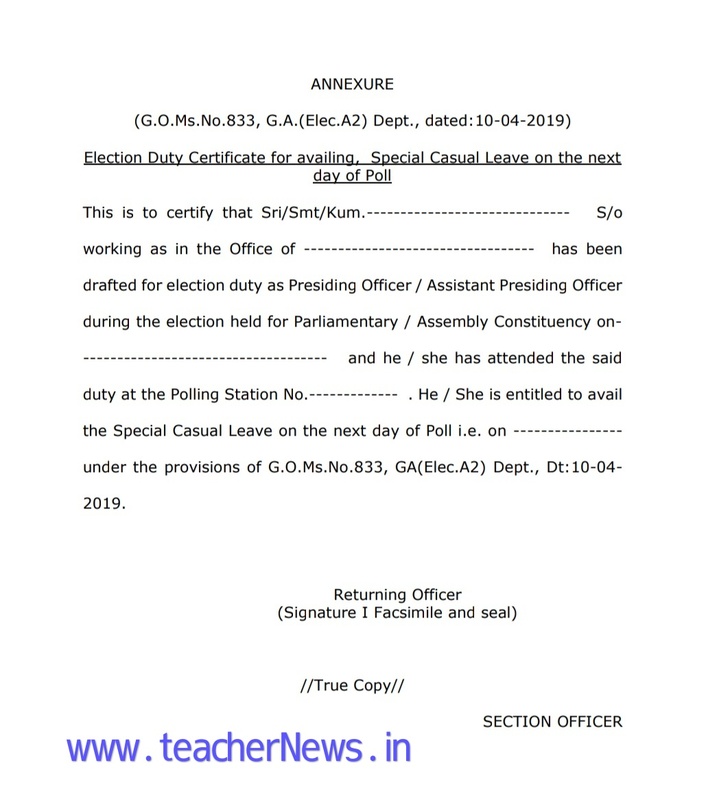 Casual Leave Sanction for PO/ APO | Duty Certificate After Polling Day on 12th April, 2019.